When I got started in this hobby many years ago, I joined numerous online fish forums and message boards. I knew I would find there some highly experienced and very knowledgeable aquarists. In fact, I came to rely on advice from some of the administrators and moderators, the folks who both manage those sites and provide solid fish keeping information. Today’s interviewee was one of those moderators, and one that it didn’t take me long to recognize as quite knowledgeable. Ted Judy has over 35 years of fish keeping experience. 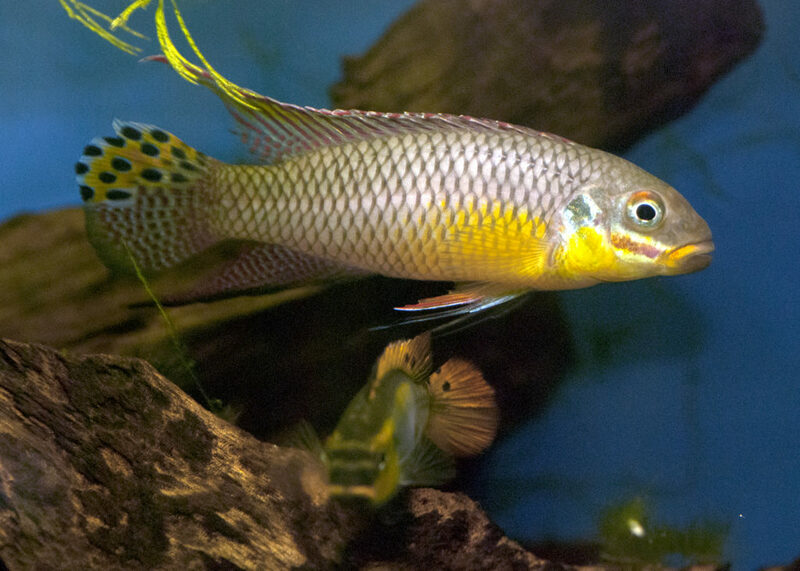 Though a ‘generalist’ in the hobby, he has a penchant for West African cichlids, especially dwarf species. 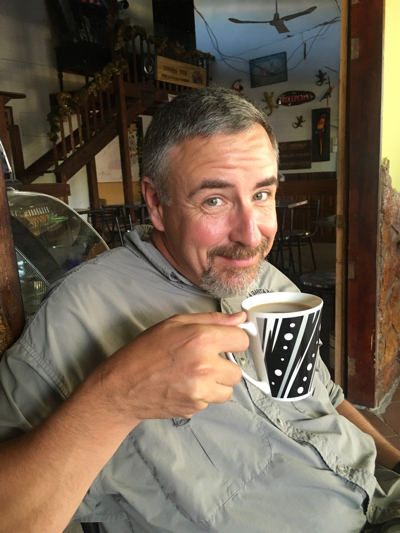 As a prolific speaker at cichlid clubs and regular cichlid events, Ted is no stranger to cichlidophiles. In fact, he gave a talk on West African cichlids at this year’s ACA convention in Detroit, which was quite fascinating. I caught up with him right after his talk at the convention and invited him to give an interview. He accepted and, though his availability has been sparse for the past several months, we got it done! The Cichlid Stage: As a prolific speaker at various aquarium clubs and the ACA, what are some secrets for giving a good presentation? I try to give presentations that I like to see – mostly pictures and videos on the screen, not a lot of words to read. A club presentation is not an academic lecture. While there is some level of learning and teaching, the goal is entertainment. TCS: You have a fondness for West African cichlids. Tell the readers about some of your favorite species and why they’re a favorite. My favorite West African species is Pelvicachromis pulcher, commonly referred to in the hobby as a ‘krib’. They are pretty, have great behavior, hardy, undemanding and easy to breed. Right behind them are all other species in the genus Pelvicachromis, which share most of P. pulcher’s attributes with some unique challenges for each species to make keeping them more interesting for the aquarist. Pelvicachromis pulcher. Photo courtesy of Ted Judy. Hemichromis cristatus. Photo courtesy of Ted Judy. 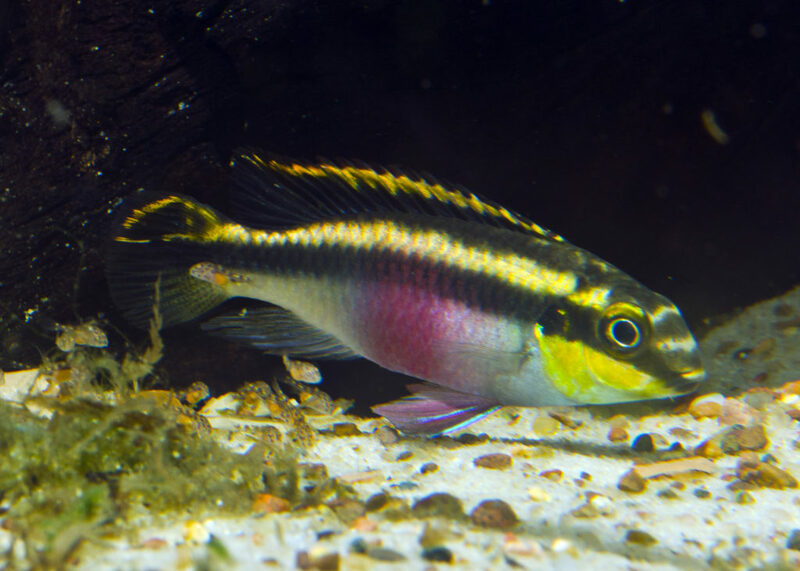 TCS: For cichlidophiles who’ve never kept West African dwarf cichlids but want to give them a try, what are some do’s and don’ts that you can share? West Africa is different from other tropical regions of the world due to geography and topography. Unlike the Amazon, Orinoco and other tropical river systems of South America, the lowland forests of West Africa do not have a seasonal flood that inundates the land for miles and miles all around. This is one reason that the cichlid diversity of West Africa is so high. The mountainous topography also creates a wider range of habitats, so defining a West African ecosystem is not as easy as defining a broad ecosystem in other parts of the world. Pelvicachromis pulcher ‘Moliwe’. Photo courtesy of Ted Judy. It’s impossible to make a general list of ‘do’ and ‘don’t’ statements that will apply to all West African cichlids. There are just too many physical variations in the places they come from. We can apply generalizations to species in the same genus, but even that is not going to be 100% accurate. A specific river system or small region may have very similar conditions. In my experience, however, there are some things to start with that will make keeping cichlids from West Africa easier and more interesting. DO start with young fish in groups of six or more and let them grow up together. If you are buying wild fish, bite the bullet and buy six or more and start them together. Aggression may eventually require that the group be reduced, but if the tank is large enough that may not be necessary. DO keep cichlids with groups of dither/target fish to make them feel more comfortable and to give a pair a common enemy to defend against. DO NOT keep the tank too warm. Most West African habitats, where the fish we most often get are from, are relatively cool in the low 70’s F.
DO over filter and keep the water very clean. These fish come from streams and have a constant flow of fresh water passing by. DO NOT overfeed the fish. A skinny cichlid is much healthier than a fat cichlid. TCS: You have traveled to many tropical locations around the world exploring native waters and collecting cichlids. What has been your favorite place to date and why? My favorite place is usually the last place I have been. Every place is special. My most recent travel destination was Colombia, and I plan to return many times. Colombia has an incredible diversity of ecosystems. It would be impossible to explore them all in one or two trips. I hope to return to Colombia for at least a few weeks every year in the foreseeable future. 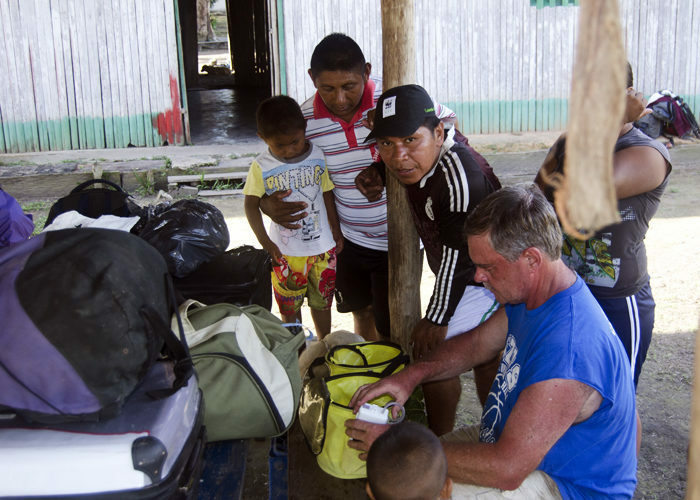 Checking collection containers of fish in Santa Rosa de Cabal, Colombia. Photo courtesy of Ted Judy. 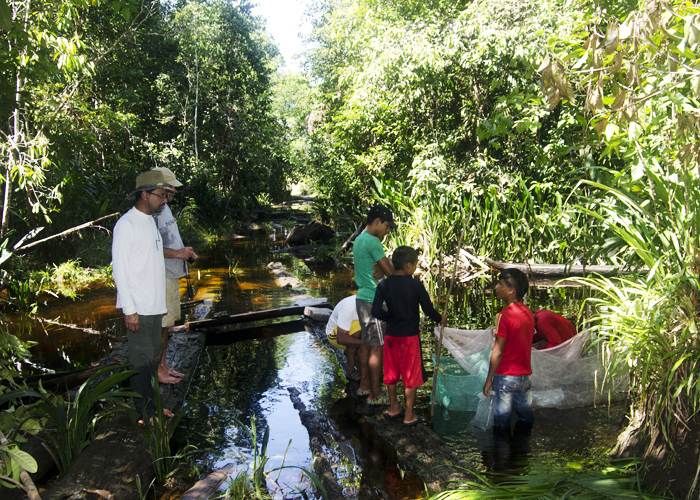 Fish collection in the Cano Vitina, a tributary of the Rio Atabapo in Colombia. Photo courtesy of Ted Judy. TCS: What are the top 5 pieces of advice you would share with an aquarist who wants to travel to South America or Africa on a cichlid collecting expedition? Safety first… in all things. Go to safe countries, go with safe people, and do safe things when you are there. Have a detailed plan of action, but be prepared to change it on a moment’s notice. Nothing ever goes 100% as planned. Learn enough of the language to get by. Everyone appreciates a visitor who tries to speak their language. Be a gracious guest, even if you are paying for everything. Friendliness and understanding helps in stressful situations. Anger and being demanding do not. You will be depending upon your guides, hosts, and drivers for EVERYTHING, and if they decide that you are not a good person your trip may become very different very quickly. Never forget that you are at their mercy. If you wake up one morning and your guides and drivers have abandoned you in the night… uh oh. Obey the laws. That means that you need to know the laws. Many countries are pretty strict about collecting fish, but you would not think that by the number of people that go places and take fish out. Removing fish illegally is bio-piracy. If you must have a licensed collector/exporter to legally get fish out of the country, then hire one as your guide. Respect the habitats and the animals. Learn how to care for fish that are collected and work hard to keep them alive. Some fish are going to die. The fewer the better, obviously, but if the death toll is high with the system you are using it will be better to collect pictures than fish. You are there to collect experiences and memories as a first priority. If you are going because you think that you are getting fish for free, you are thinking about the trip in the wrong way. It would be cheaper to buy the fish locally, even if the fish costs you $1000. That logic does not apply in places where fish are not exported, and the only way to get them is to go collect them yourself. There are no guarantees that fish you collect will make it home, so accept that possibility and think of obtaining fish as a bonus to having the experience. TCS: You have posted many videos of your exotic adventures along with videos of your fish room. Tell the readers about your fish room and how it got started. I got started in the hobby as a boy collecting animals in my area and keeping them in jars. My first legit aquarium with fish happened when I was 10-years-old. That tank was set up in 1977, the first fish were six black mollies (four of which died), and the next fish were two Pelvicachromis pulcher. Those were the ‘gateway’ cichlids. They spawned for me, I was fascinated, and the rest is a blur of hundreds of tanks, thousands of fish, and a lot of fun (and heartache). I have worked in various capacities in the aquarium industry, so I have been fortunate to have access to a lot of different technologies and animals. I currently have one aquarium. The fish room is going to be remodeled into a gallery of display tanks. 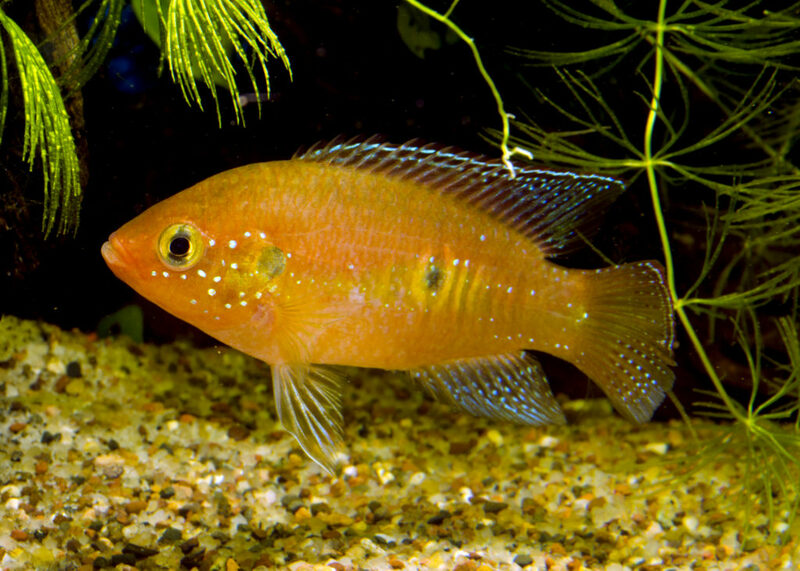 TCS: Based on your extensive experience raising and breeding cichlids, share with the readers some best practices that you’ve established for success. I can boil down 40 years of aquarium keeping and cichlid breeding into a few statements. Respect the life of a fish, because when you choose to keep it in an aquarium you are making a commitment to keeping it well. The people in the aquarium hobby are as important as the fish. Inbreeding is a fast road to ruin. When you are frustrated with fish keeping and are no longer caring for your tanks as well as you should, find homes for the fish, empty the tanks and take a break (but do not sell the glass… someday you will want it all back again). TCS: What are some aquarist “myths” that you can dispel for the readers? Slow acclimation for water chemistry is not necessary in 90% of the cases, and can be harmful in the other 10%. Acclimate to temperature. Cut the bag. Net the fish. Release them into the tank. Myth: Ich can be cured with salt, heat, and water changes. No, it cannot. Salt may stress the parasite and possibly prevent an outbreak. Heat speeds up the lifecycle. A good medication will kill it if used correctly. If you have had success with salt, heat, and water changes, it is because the fish are healthy and their immune system won the fight, but the parasites are not gone. They will be back. A UV sterilizer helps too, and can take the place of using a medication if the fish being treated are too sensitive to the meds. Myth: Chlorine in tap water concentrations will kill beneficial bacteria in a sponge filter. No, it will not. Microbiologists will tell you that the species of bacteria our tanks depend upon are extremely resilient, can tolerate a lot of chlorine, and can even tolerate hot tap water. So go ahead and wash that sponge out in a sink. Shake out all the water and put it back in the tank. If you are very worried about residual tap water in the sponge, dip it in dechlorinated water for a quick rinse. Along the same lines, the best bacterial colonies for cleaning ammonia and nitrite out of water are growing colonies. So when you clean a filter you WANT 50% of the bacteria to be flushed away. The population will quickly rebound. Clean your filters. Clean them regularly. Old, dirty filters are disease banks. TCS: Where do you see the cichlid hobby in the next five years? The cichlid hobby is the aquarium hobby. I do not see it as something different. The next five years will see more pressure from opposing groups to reduce or eliminate the aquarium hobby. So far, we have been able to fend off the attacks, but those attacks are getting more sophisticated. The aquarium hobby is learning slower than the groups attacking it. Within five years I suspect that we will see significant changes to how fish can be transported around the country, possibly even eliminating the practice of shipping fish through the mail. The hobby is also becoming more regional, and large national events are becoming less important. We can either embrace the model of many smaller regional events (and support them) or we can die fighting the good fight. Our hobby’s national organizations need to consider partnering with regional events and have a presence at all of them. I predict that within five years we will see one or more of the major national associations skip its convention due to lack of a host club, because the host clubs are all doing their own thing. Lastly, it is very likely in the next five years that the cost of wild fish will increase significantly due to the rising standard of living where the fish come from (a good thing) and the rising cost of transportation (unstoppable). Therefore, captive populations and responsible breeding will become even more important.